Of all the terracotta public buildings in Birmingham designed by William Martin of Martin & Chamberlain, one of the most dramatic compositions is the Green Lane Library & Baths, Small Heath, with a circular clock-tower at the apex of a sharply triangular site between Green Lane and Little Green Lane. 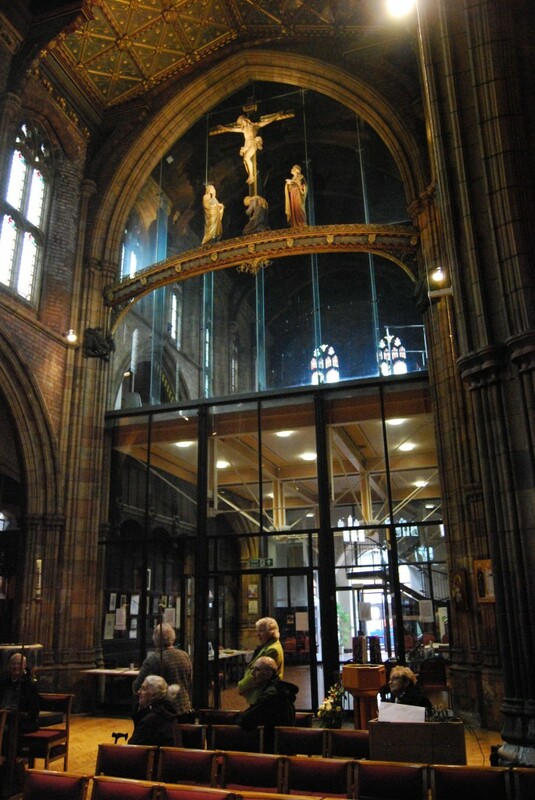 The library was opened 1894, and after the well was sunk in 1896 the first- and second-class swimming pools and public baths were begun in 1897 and opened 1901. The swimming baths were bombed on October 18th 1940 and rebuilt in 1951. The building closed in 1977 and was sold for £24,000 two years later for conversion to a mosque and community centre. 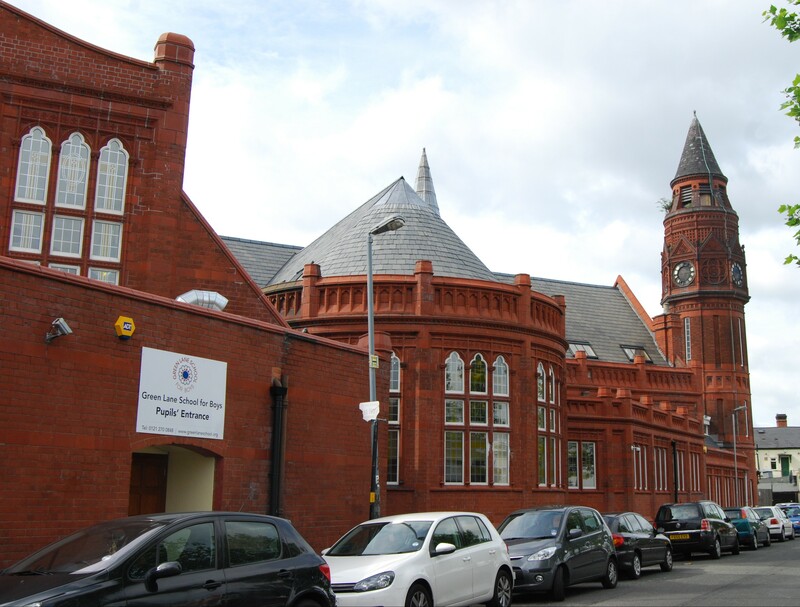 The community had previously worshipped in two terraced houses is Alum Rock; the spacious facilities at Green Lane enabled them to expand to provide worship space with ablution facilities, a mortuary, a reference library and a community hall. The Green Lane Masjid and Community Centre was completed in 2008, and the Green Lane Independent Boys School opened in 1911: http://www.greenlanemasjid.org/about-us/history.aspx. For details of Mike Higginbottom’s Birmingham’s Heritage lecture, please click here. The 80-page, A4 handbook for the 2013 Birmingham’s Heritage tour, with text, photographs, maps and a reading list, is available for purchase, price £15.00 including postage and packing. To view sample pages click here. Please send a cheque, payable to Mike Higginbottom, to 63 Vivian Road, Sheffield, S5 6WJ. This entry was posted in Birmingham's Heritage, Victorian Architecture on February 23, 2016 by Mike Higginbottom. Nechells, on the north-east fringe of central Birmingham, was a gritty place of canals, railway lines and gas-works and power stations, for which the terracotta public buildings of the “Civic Gospel” were much-needed amenities. Bloomsbury Library had been built in 1892 with a police- and fire-station attached, but no swimming baths. Baths were vital in working-class districts, not so much as leisure centres but as an indispensable aid to personal hygiene. Slipper baths were a desirable alternative to the tin bath in front of the fire. 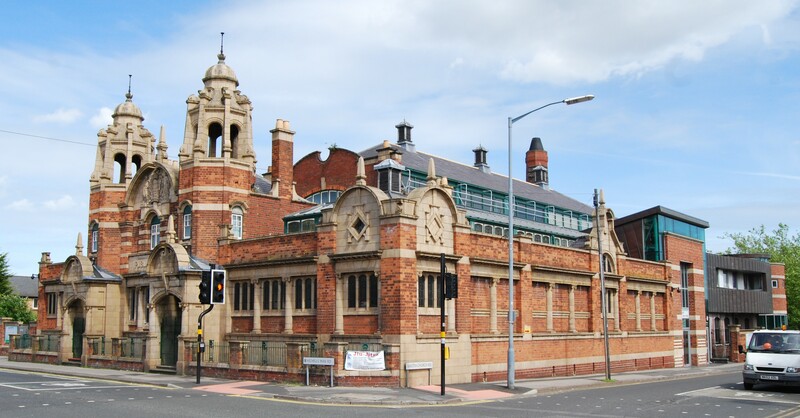 Though the site was purchased in 1903, construction of Arthur Harrison’s design began only in 1908, and the swimming bath and male and female private baths were opened in 1910. For many years it provided winter assembly facilities when the bath was boarded over. It closed in 1996 and became badly vandalised. It was handed over to the Birmingham Foundation (now the Birmingham & Black Country Community Foundation) and with the financial support of Advantage West Midlands, the Heritage Lottery Fund and the European Regional Development Fund it was restored as a multi-purpose community facility providing a crèche and nursery facilities, an internet café, office accommodation for not-for-profit community organisations, a youth club, community bingo and a thriving dance group. The restoration used recycled demolition materials to provide a new entrance portico with an extension faced in natural copper and a rotunda of masonry, brick and glass. This entry was posted in Birmingham's Heritage, Victorian Architecture on February 17, 2016 by Mike Higginbottom. The promise of baths and a library was part of the agreement by which Balsall Heath, formerly part of Warwickshire, was brought within the city of Birmingham. The Moseley Road Library with its clock tower was designed by Jethro Anstice Cossins & Barry Peacock, with an elaborate terracotta municipal coat of arms by Benjamin Creswick, and opened in 1895. This is the same team who had built the Bloomsbury Library, Nechells in 1892. The baths by William Hale & Son opened in October 1907. The facilities included a galleried first-class and second-class swimming bath (both for men only), first- and second-class private baths for men and women, a small laundry, a clubroom and the public library. In recent years problems with the building and with budgetary cutbacks have repeatedly threatened the complex since its Grade II listing was upgraded to II* in 2004. 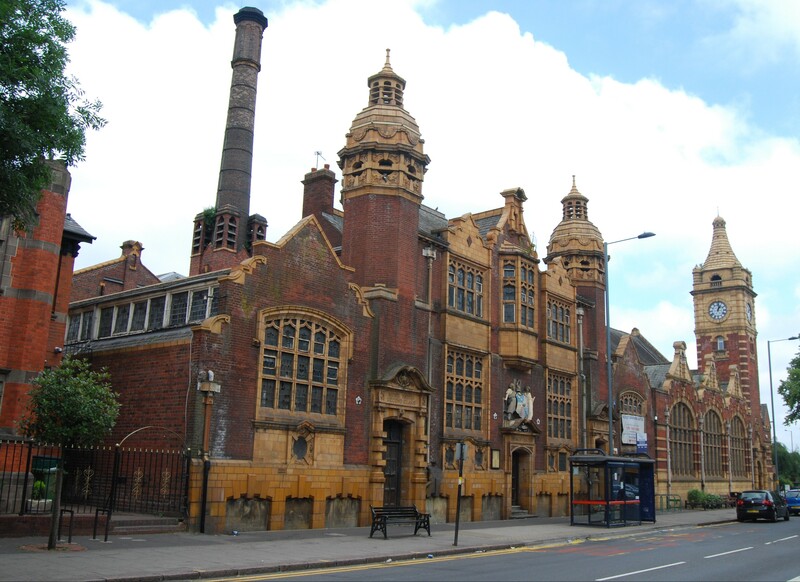 It is one of only three Grade II* listed swimming baths in the country. Its irreplaceable features include the only remaining complete set of forty-six pre-war slipper baths in Great Britain, still with the original oak ticket office and attendants’ kiosks largely intact, the money-taker’s flat, a vast cold-water tank and, in the first-floor laundry, what may be the only surviving steam-heated drying racks in a British swimming baths: http://www.poolofmemories.co.uk/explore-the-building. The photographer Mike Jones’ images of the baths are at http://www.dailymail.co.uk/news/article-2942386/Haunting-images-Edwardian-swimming-baths-built-1907-lying-abandoned.html. Update: At last, it seems the future of the baths has turned a corner: https://www.nationaltrust.org.uk/features/the-next-steps-for-moseley-road-baths. This entry was posted in Birmingham's Heritage, Victorian Architecture on December 4, 2015 by Mike Higginbottom. 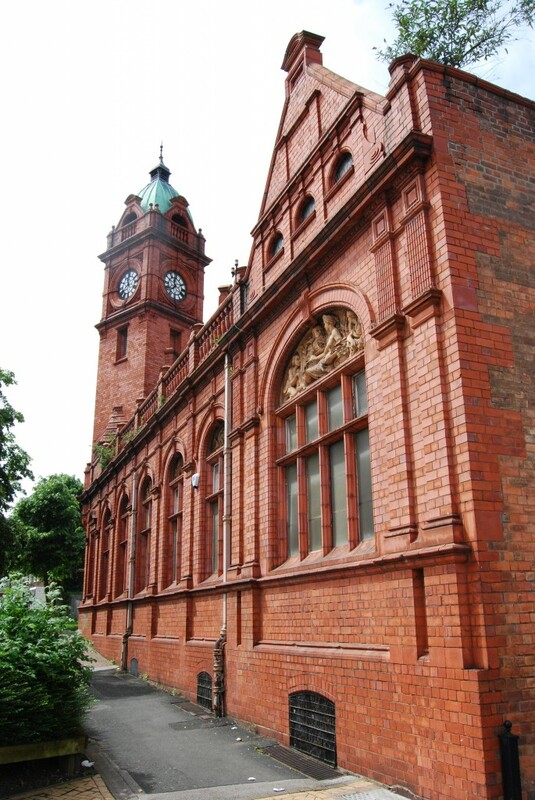 One of the smallest and most magical of Birmingham’s terracotta municipal libraries is Bloomsbury Library at Nechells, designed by Jethro Anstice Cossins and Barry Peacock and opened in 1892. Its wedge-shaped footprint shows that Bloomsbury Library once dominated a road-junction; now the ring-road intersection dominates it. The attached police and fire station has been demolished. The largest of the exterior relief panels by the Birmingham artist Benjamin Creswick shows a female figure representing Birmingham receiving the gifts of the city’s Arts, Crafts and Industries. The others reflect the life of the community that the building was built to serve – agriculture and industry, sport and home life from childhood to old age. The Library was restored in 1993, and when I last visited in 2013 it was fully functioning, though the entrance was shored up and planned renovations were on hold. Since then its condition has gone from bad to worse and is now dire. The heating system is beyond repair and the theft of lead from the roof has caused sufficient water ingress to close the place. The Birmingham Mail has revealed that the library staff have been quietly told that the game is up [http://www.birminghammail.co.uk/news/local-news/historic-birmingham-library-closes-after-6247779] and this has been tacitly confirmed by a local councillor: [https://birminghamlibrariescampaigns.wordpress.com/2013/12/13/the-future-of-bloomsbury-library-in-nechels]. Library services to the local community are being maintained by a mobile library [http://www.libraryofbirmingham.com/1318249091974] and the library was offered for lease at a peppercorn rent with a guide-price, £100,000, that reflected the amount that would be needed to make the Grade II listed building useable again: http://www.rightmove.co.uk/property-for-sale/property-48428552.html. According to the Victorian Society, it was sold at the end of October 2014. This entry was posted in Birmingham's Heritage, Victorian Architecture on November 29, 2015 by Mike Higginbottom. Spinning round the roundabout on Icknield Street, Ladywood, on the outskirts of central Birmingham, you could be forgiven for thinking that Spring Hill Library was a church, because of its imposing 65-foot clock tower. In fact, William Martin’s 1893 design in a fortissimo version of Martin & Chamberlain’s characteristic Gothic dominates what was once a street-corner site and is now an island on the Middle Ring Road. The original layout placed a double-height public reading-room on the ground-floor with a closed-access lending library in the gallery upstairs. This formation was reversed in 1926, to give easier access to lending-library users by extending the gallery as a reading room and cluttering the ground-floor space with shelves. The library was an immediate success, breaking Birmingham city branch libraries’ record for issuing books in its first year of operation. There was an incident in 1895 when a youth was sentenced to six weeks’ hard labour for “throwing books around the library and resisting arrest”. The exterior bears the scars of a much later drama, when a number 8 bus was in collision with a fire engine and overturned, killing one and injuring over thirty more. When Ladywood was redeveloped in the early 1970s, the intended path of the ring road was realigned in response to loud objections to the demolition of the library. More recently, the surrounding redevelopment has itself been redeveloped by the construction of a splendid Tesco supermarket which opened in 2010 and provided the Victorian library with a practical entrance and a lift. Four years later, this functioning branch library was threatened by closure because of the financial constraints on the city council: http://www.birminghammail.co.uk/news/four-birmingham-libraries-facing-closure-6556612. Public libraries are an endangered species, Grade II* building less so. But it would be a pity if Spring Hill Library ceased to be the home of books. This entry was posted in Birmingham's Heritage, Victorian Architecture on November 24, 2015 by Mike Higginbottom. The Anglican parishes around the Birmingham Small Arms factory in Small Heath were carved out of the ancient parish of Aston between 1846 and the end of the nineteenth century, and became part of the Anglo-Catholic “biretta belt” of South Birmingham. One of the last of these was St Aidan’s Church, begun in 1893, designed in red brick with buff terracotta by Thomas Frederick Proud (d 1901), with a clergy house, intended for a team of single curates, by the Birmingham metalworker and architect Arthur Stansfield Dixon (1856-1929). The eastern end of the church – chancel, guild chapel and two bays of the nave – was completed in 1894 and consecrated two years later; the western end including the baptistery and bellcote was finished by the end of 1898. Once the shell of the church was complete, Arts & Crafts designers supplied much of the decoration: Bertram Lamplugh of the Birmingham School of Art designed the Good Shepherd window in the Guild Chapel in 1907, and Frederick Bligh Bond (1864-1945) and W E Ellery Anderson (1888-1942) collaborated with the incumbent, Canon Newell Long, to begin an ambitious decorative scheme, some of which remained unexecuted because of the intervention of the Great War. The last decorative addition during Canon Long’s incumbency was the free-standing reredos for the Sanctuary by Ellery Anderson, executed by Mowbray & Sons of Oxford and dedicated in 1921. The grandiose celebrations of Anglo-Catholic worship created continuing problems within the politics of the Birmingham diocese. Bishop Ernest W Barnes (1874-1953; bishop 1924-1953) took against the figures on the Rood Screen, the reservation of the Blessed Sacrament and the use of incense, and at one stage refused to take confirmations within the parish. St Aidan’s was valued highly by the early aficionados of Victorian and Edwardian art and architecture, such as John Betjeman – “[a] successful Perpendicular design in red brick and terra cotta”, Sir Nikolaus Pevsner – “a striking and successful example of the local red brick and terracotta school…with an atmosphere much encouraged by the splendid Rood and Screens”. 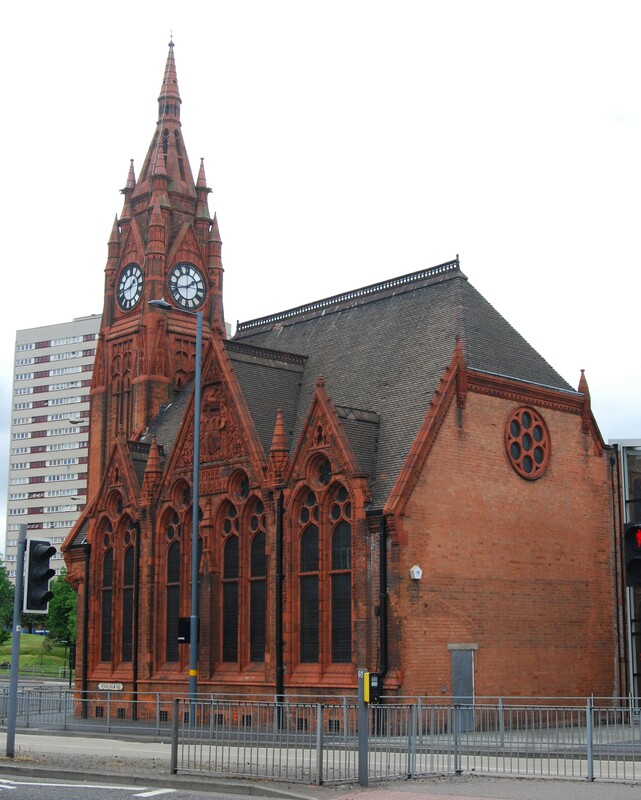 The Victorian Society identified it as “one of the six or seven finest Victorian churches in Birmingham”. Housing clearance and the collapse of the BSA company in 1973 encouraged the flight of the local population. By 1991, only nine of St Aidan’s communicants lived within the parish boundary. Meanwhile an influx of Asian families meant that by 1997 at least 65% of the population within the parish was Muslim, and most of the local schools had at least 90% Muslim pupils on roll. From 1994 the diocese of Birmingham closed and disposed of surplus buildings in the parishes of St Gregory and St Oswald, and concentrated activity on the St Aidan’s site, while renaming the parish All Saints to commemorate the dedication of the original early Victorian parish. The St Aidan’s building was radically reordered, reversing the direction of worship to use the apsidal baptistery as a sanctuary, enlarging the Lady Chapel to provide an intimate worship space and forging an entrance directly on to the street with a meeting-hall above where the High Altar had formerly stood. The Victorian Society vigorously opposed this attack on the historical integrity of the building, and in 1998 forced the issue to a Consistory Court where the Chancellor found against them, accusing the Society of acting “arrogantly, unreasonably and without common sense”. This fine church, the “Cathedral of the Back Streets”, continues to serve its purpose under the oversight of the Bishop of Ebbsfleet in an environment vastly different to that for which it was built. For details of Mike Higginbottom’s lecture Survivals & Revivals: past views of English architecture, please click here. This entry was posted in Birmingham's Heritage, Sacred Places, Survivals & Revivals: past views of English architecture, Victorian Architecture on January 28, 2014 by Mike Higginbottom. Birmingham’s Town Hall was the centre of its musical life from its opening in 1834 until 1991, and the home base for the City of Birmingham Symphony Orchestra from its inauguration in 1920. When Sir Simon Rattle became Principal Conductor & Artistic Adviser in 1980, and Music Director from 1990, he made it his business not only to develop the orchestra further but to provide it with a better home. 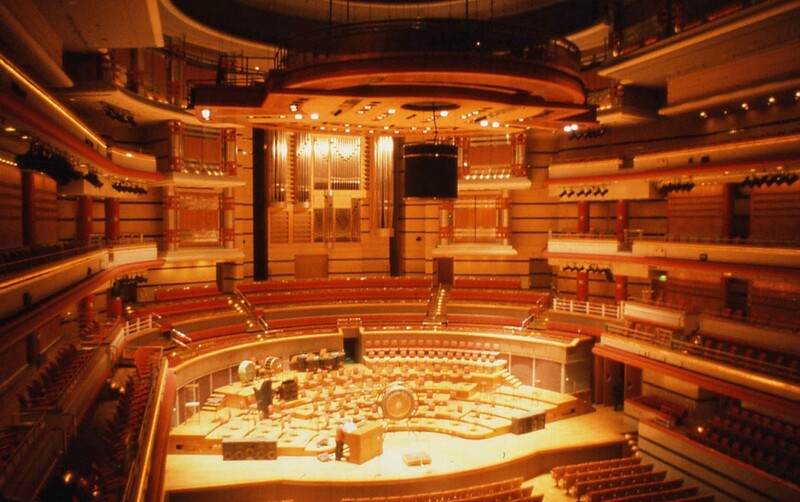 Symphony Hall is primarily a concert hall which can be adapted for conference use, with 2,200 seats, 63m long, 31m wide and 22m high. The seating is tiered, with 877 on the main floor, 347 on the first gallery-tier, 291 on the second and 485 on the third. At the rear of the platform there is seating for a choir of up to two hundred. The design combines traditional materials and sophisticated technology to provide flexible acoustics for every musical genre from chamber music to the most ambitious orchestral and choral works. It has sliding acoustic control banners to reduce reverberance, an adjustable reverberation chamber above and behind the stage fitted with twenty concrete swing-doors each weighing approximately eight tons to vary the volume of the auditorium by up to 30% and a 42-tonne acoustic canopy. Its reverse fan shape is based on traditional opera houses and concert halls, with the audience stacked in tiers in a narrow chamber. Russell Johnson advocates using wood “…similar to that of a violin”. The perimeter walls of the Hall are one foot thick, and much of the acoustic quality comes from this sheer weight of materials. Ironically, this masterpiece of modern acoustic design stands only 35m from the busiest rail tunnel in Britain, running under Monument Lane to the southern approach to New Street Station. In fact the Hall is located as far away as possible from the railway line. (A proposal to create further space by moving the Crown public house across the canal was rejected.) The railway tracks were relaid with rubber-lined sleepers, and the silence of the Hall is protected by noise-insulating piles and mountings designed by Ove Arup & Partners. Like its predecessor, the Town Hall, it was incomplete when it was opened. The front pipes and casework for the Klais organ were installed in time for the opening by HM Queen Elizabeth II on June 12th 1991; the organ itself – the largest mechanical-action instrument in the United Kingdom – was inaugurated in 2001. Now the two halls run in tandem, providing the city of Birmingham with an unrivalled diet of musical experiences. Take a look at what’s on – the variety is astonishing: https://www.thsh.co.uk. This entry was posted in Birmingham's Heritage, Life-enhancing experiences on January 26, 2014 by Mike Higginbottom. Birmingham’s answer to New York’s Flatiron Building is commonly known as the Red Palace, standing at the sharp angle between Constitution Hill and Hampton Street. Originally it was the factory-workshop of H B Sale, die-sinkers. Designed by William Doubleday & James R Shaw in 1895-6, it demonstrates the value of terra-cotta as a material that was relative cheap to manufacture and produced rich architectural effects – in this case, according to Andy Foster’s Pevsner Architectural Guide, Birmingham (2005), “eclectic Gothic with Spanish touches”. This adaptable material had obvious benefits for a commercial organisation that wished to make an impact without extravagant expense. Its unusual layout was put to practical use. Each floor was a triangular open-plan workshop with an office at the apex. The modern fifth storey is unfortunate. For years now its lower storeys have been occupied by a succession of restaurants. The elaborate cupola is sprouting vegetation. This fine ornament to Birmingham’s streetscape is clearly underused. This entry was posted in Birmingham's Heritage, Survivals & Revivals: past views of English architecture, Victorian Architecture on January 25, 2014 by Mike Higginbottom. Boulton and Watt made their fortunes but realised that when their patent expired in 1800 they must build complete engines, rather than fabricate engine-parts and draw royalties on the invention. Boulton’s Soho Manufactory was unsuitable for full-scale engine construction, so they established the Soho Foundry, about a mile away alongside the Birmingham Canal in Smethwick in 1796. Their eventual third partner, William Murdoch (1754-1839), developed the manufacture of gas-lighting equipment at the Foundry. The original partners passed on the business, Boulton, Watt & Co, to their respective sons, Matthew Robinson Boulton (1770-1842) and James Watt Jnr (1769-1848). After James Watt Jnr’s death the company became James Watt & Co and continued to build steam engines almost to the end of the nineteenth century. The Soho Foundry built the screw engines for Brunel’s SS Great Eastern (1859), and the ornate pumping-engines that are preserved at the Papplewick Pumping Station, Nottinghamshire (1884). In 1895 the site was taken over by the weighing-machine maker, W & T Avery, whose successor, Avery Weight-Tronix, continues to innovate and manufacture on the site. Though actual casting ended in 1954, the site has remained a key location for the development of digital weighing equipment of many kinds. The ground is rich in archaeology, much of which remains to be uncovered. The gatehouse block houses the fascinating Avery Historical Museum. And high on a gable in the surviving Forge buildings is the name ‘James Watt & Co’, linking back to the dour Scotsman whose genius transformed the world. There can’t be many industrial sites in Britain that have worked continuously since the late eighteenth century. This entry was posted in Birmingham's Heritage on January 24, 2014 by Mike Higginbottom. If any one location within the city epitomises this display of ingenuity it is three stops up the Metro tram-route from Snow Hill, where stood the Soho Manufactory, an integrated workshop, powered at first by water: http://en.wikipedia.org/wiki/File:Soho_Manufactory_ca_1800.jpg. 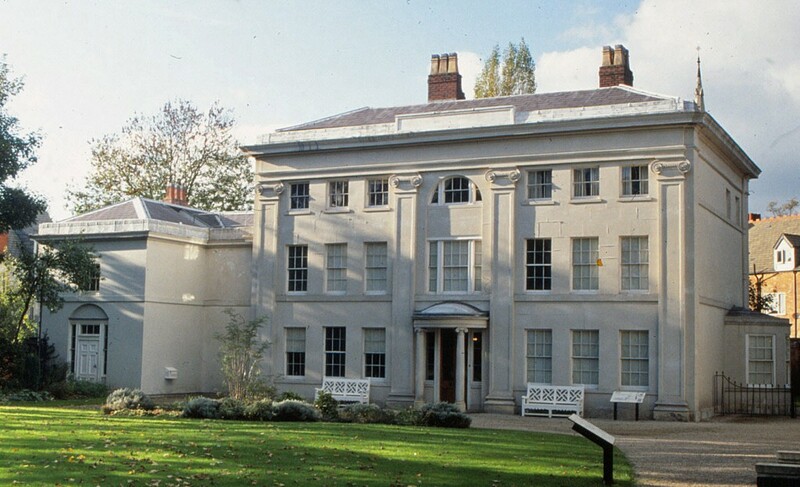 This was the work-base of a manufacturing genius, Matthew Boulton (1728-1908), initially a “toy” manufacturer, producing not playthings but miscellaneous small metal articles ranging from buttons and buckles to high-quality decorative products in steel, ormolu, Sheffield plate and precious metals. The steam engines were eventually prefabricated at the Soho Foundry, opened in 1796, while Boulton developed the Soho Mint (1788) to manufacture coinage resistant to counterfeiting. He was also primarily responsible for establishing the Birmingham Assay Office (1773), the New Street Theatre (1774) and the town’s first hospital and dispensary. He lived in elegant surroundings at Soho House (Samuel Wyatt 1766), a building full of surprises. The exterior is not stone, but slate cladding covered with sand-dredged paint. The glazing bars, some of which survive, were of “Eldorado”, an experimental metal supplied by James Keir, a Lunar Society member. Boulton installed a practical steam-heated indoor bathroom and was supplied with a Bramah patent water closet in 1787. Evidence of the warm-air circulating central-heating system, installed c1810, can still be seen in the cellars, on the stairs and in one of the upstairs rooms. Though the parkland surrounding Soho House has long since been built on, the main block of the house survives and is beautifully restored: http://www.bmag.org.uk/soho-house. Its interpretation makes it easy to recreate the exciting, welcoming atmosphere of the eighteenth-century equivalent of Silicon Valley.